ACF by Nameeks ACF ANS14-LC New Space 23-in. Single Bathroom Vanity Set. Modern wall-mounted vanity set. Engineered wood Cabinet with metal feet and pulls. Larch Canapa finish with polished chromed accents. 1 soft-close cabinet door. Choice of faucet drill holes. Rectangular white ceramic sink bowl. Includes vanity, sink, medicine cabinet, vanity light, 4 chrome feet. Faucet not included. The clean lines of the ACF by Nameeks ACF ANS14-LC New Space 23-in. 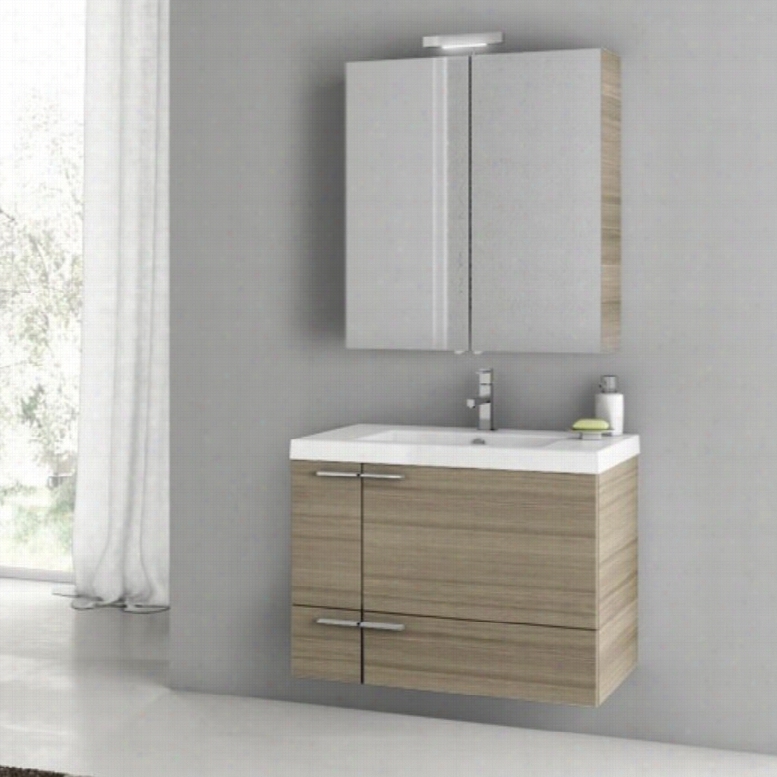 Single Bathroom Vanity Set - Larch Canapa offer unmatched modern style. Including a vanity, sink, medicine cabinet, vanity light, and four chrome feet, this set has everything you need for a chic overhaul of your bathroom. All you need to do is choose your ideal faucet. Since the vanity mounts securely to your wall, you can choose to add the chrome feet for an extra accent or not. Either way, the chunky chrome hardware plays perfectly off the Larch Canapa finish of the vanity.Component Dimensions:Vanity dimensions: 23.4W x 17.7D x 21.8H in.Medicine cabinet dimensions: 23.6W x 30.3H in.Fitted rectangular sink dimensions: 23.6W x 17.7D in.About NameeksFounded with the simple belief that the bath is the defining room of a household, Nameeks strives to design a bath that shines with unique and creative qualities. Distributing only the finest European bathroom fixtures, Nameeks is a leading designer, developer, and marketer of innovative home products. In cooperation with top European manufacturers, their choice of designs has become extremely diversified. Their experience in the plumbing industry spans 30 years, and is now distributing their products throughout the world today. Dedicated to providing new trends and innovative bathroom products they offer their customers with long-term value in every product they purchase. In search of excellence, Nameeks will always be interested in two things: the quality of each product and the service provided to each customer. 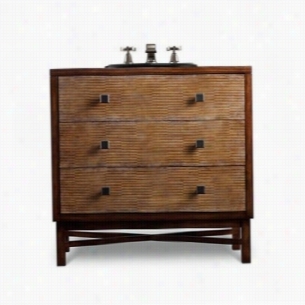 Cole & Co 11-22-275534-27 - Baker Hall Chest Bathroom Vanity. ACF by Nameeks ACF CD04-GA Crystal Dance 28-in. Single Bathroom Vanity Set. Modern wall-mounted vanity set. Engineered wood cabinet with metal pulls. Glossy Anthracite finish with polished chromed accents. 2 soft-close cabinet doors. Choice of faucet drill holes. Rectangular white ceramic sink bowl. 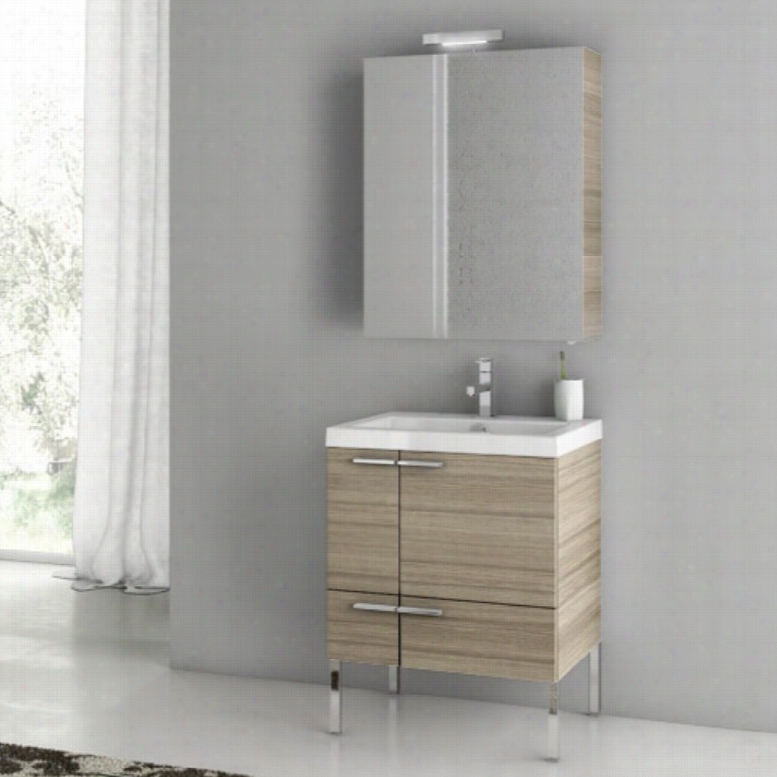 Includes wall-mounted vanity, fitted glass sink, mirror, vanity light, short storage cabinet, and chrome towel rail. Faucet not included. With all you need right in reach, the ACF by Nameeks ACF CD04-GA Crystal Dance 28-in. 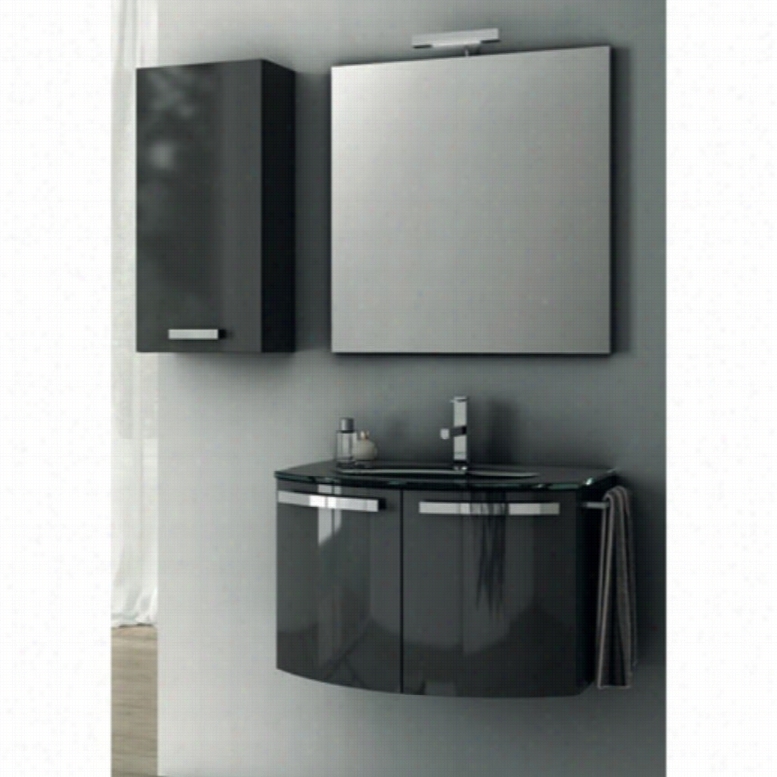 Single Bathroom Vanity Set - Glossy Anthracite brings its sophisticated design to the table. Just choose a faucet, this six-piece set comes complete with vanity, fitted glass sink, mirror, vanity light, short storage cabinet, and chrome towel rail. The glossy anthracite finish of the vanity is complemented just right by the chrome hardware. You'll be dazzled by the floating effect of the vanity mounting off the floor securely to your wall.Component Dimensions:Vanity dimensions: 27.6W x 20.1D x 17.5H in.Mirror dimensions: 28.3W x 27.6H in.Fitted rectangular sink dimensions: 23.6W x 17.7D in.About NameeksFounded with the simple belief that the bath is the defining room of a household, Nameeks strives to design a bath that shines with unique and creative qualities. Distributing only the finest European bathroom fixtures, Nameeks is a leading designer, developer, and marketer of innovative home Products. In cooperation with top European manufacturers, their choice of designs has become extremely diversified. Their experience in the plumbing industry spans 30 years, and is now distributing their products throughout the world today. Dedicated to providing new trends and innovative bathroom products they offer their customers with long-term value in every product they purchase. In search of excellence, Nameeks will always be interested in two things: the quality of each product and the service provided to each customer. ACF by Nameeks ACF ANS02-W New Space 31-in. Single Bathroom Vanity Set. Modern wall-mounted vanity set. Engineered wood cabinet with metal feet and pulls. Wenge finish with polished chromed accents. 1 soft-close cabinet door. Choice of Faucet drill holes. Rectangular white ceramic sink bowl. Includes vanity, sink, mirror, vanity light. Faucet not included. Look no further, the ACF by Nameeks ACF ANS02-W New Space 31-in. 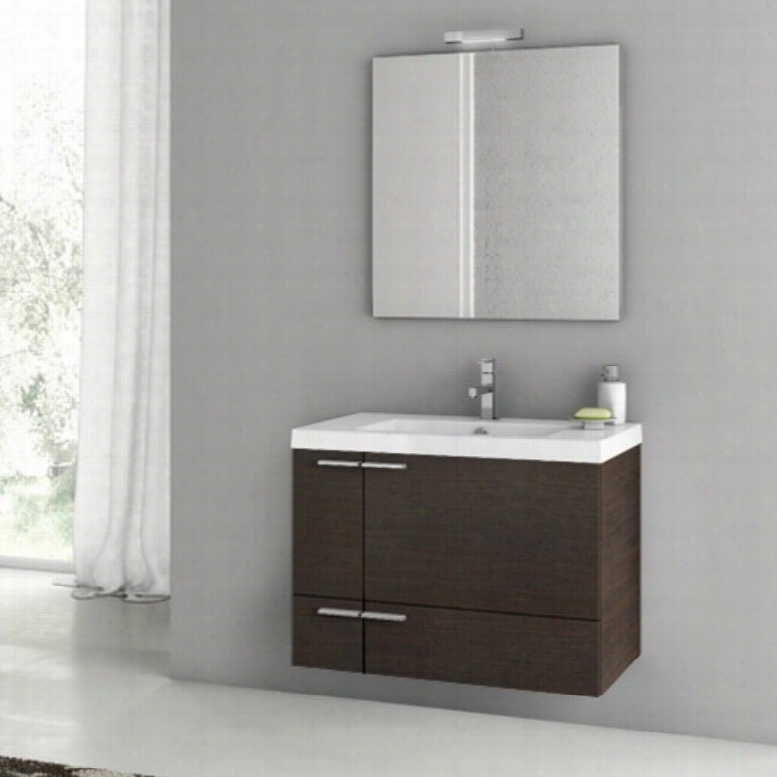 Single Bathroom Vanity Set - Wenge has everything you need to transform your bathroom. 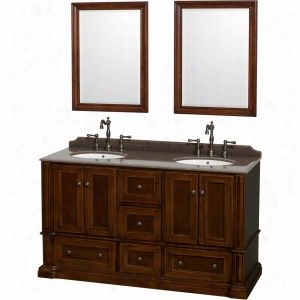 This alluring four-piece set is the whole package with the vanity, sink, mirror, and vanity light all included. It floats elegantly above your bathroom floor thanks to a sturdy wall-mounted design. You'll love how the chrome hardware plays off the Wenge finish of the cabinet. This refined modern set lets you choose your ideal faucet to complete the set.Component Dimensions:Vanity dimensions: 31.3W x 17.7D x 21.8H in.Mirror dimensions: 28.3W x 27.6H in.Fitted rectangular sink dimensions: 23.6W x 17.7D in.About NameeksFounded with the simple belief that the bath is the defining room of a household, Nameeks strives to design a bath that shines with unique and creative qualities. Distributing only the finest European bathroom fixtures, Nameeks is a leading designer, developer, and marketer of innovative home products. In cooperation with top European manufacturers, their choice of designs has become extremely diversified. Their experience in the plumbing industry spans 30 years, and is now distributing their products throughout the world today. Dedicated to providing new trends and innovative bathroom products they offer their customers with long-term value in every product they purchase. In search of excellence, Nameeks will always be interested in two things: the quality of each product and the service provided to each customer. Wyndham Collection WCVJ23160DCHIBUNOM24 - 60" Double Bathroom Vanity in Cherry, Imperial Brown Granite Countertop, Undermount Oval Sinks, & 24" Mirrors. ACF by Nameeks ACF ANS13-LC New Space 31-in. Single Bathroom Vanity Set. Modern wall-mounted vanity set. Engineered wood cabinet with metal feet and pulls. Larch Canapa finish with polished chromed accents. 1 soft-close cabinet door. Choice of faucet drill holes. Rectangular white ceramic sink bowl. Includes vanity, sink, medicine cabinet, vanity light. Faucet not included. The ACF by Nameeks ACF ANS13-LC New Space 31-in. 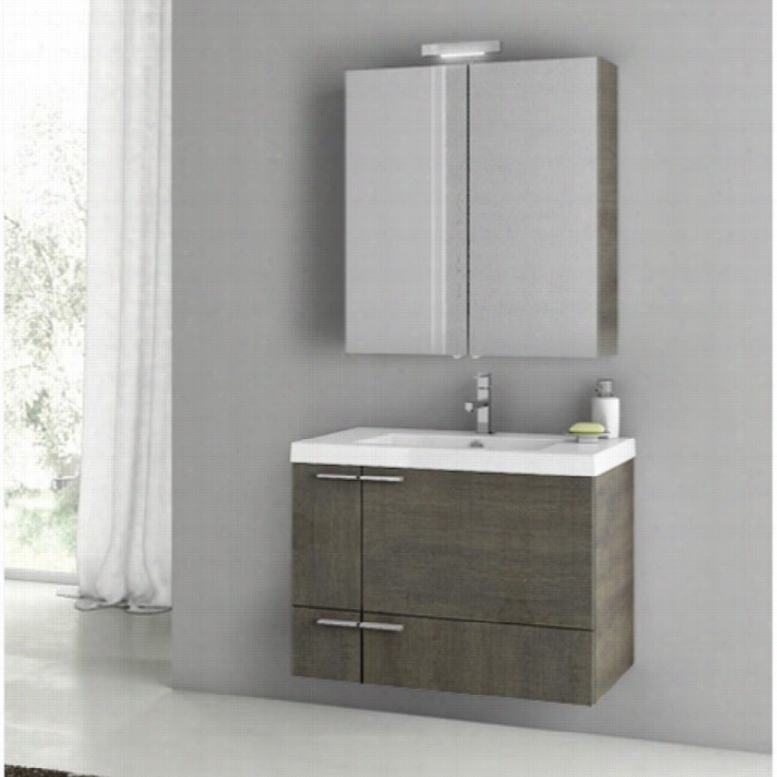 Single Bathroom Vanity Set - Larch Canapa doesn't sacrifice function for style. Complete with vanity, sink, medicine cabinet, and vanity light, this four-piece set is just the way to tie your bath together. Its clean, modern styling is given a leg up by the wall-mounted design letting the cabinet float above the floor. You'll simply adore how the chunky chrome hardware plays off the Larch Canapa finish of the cabinet. All that's left for you is to choose your ideal faucet.Component Dimensions:Vanity dimensions: 31.3W x 17.7D x 21.8H in.Medicine cabinet dimensions: 27.6W x 30.3H in.Fitted rectangular sink dimensions: 23.6W x 17.7D in.About NameeksFounded with the simple belief that the bath is the defining room of a Household, Nameeks strives to design a bath that shines with unique and creative qualities. Distributing only the finest European bathroom fixtures, Nameeks is a leading designer, developer, and marketer of innovative home products. In cooperation with top European manufacturers, their choice of designs has become extremely diversified. Their experience in the plumbing industry spans 30 years, and is now distributing their products throughout the world today. Dedicated to providing new trends and innovative bathroom products they offer their customers with long-term value in every product they purchase. In search of excellence, Nameeks will always be interested in two things: the quality of each product and the service provided to each customer. ACF by Nameeks ACF ANS13-GO New Space 31-in. Single Bathroom Vanity Set. Modern wall-mounted vanity set. Engineered wood Cabinet with metal feet and pulls. Gray Oak finish with polished chromed accents. 1 soft-close cabinet door. Choice of faucet drill holes. Rectangular white ceramic sink bowl. Includes vanity, sink, medicine cabinet, vanity light. Faucet not included. Style meets function in the ACF by Nameeks ACF ANS13-GO New Space 31-in. Single Bathroom Vanity Set - Gray Oak. Complete with vanity, sink, medicine cabinet, and vanity light, this four-piece set is just the way to tie your bath together. Just make your choice of faucet. Its clean, modern styling is given a leg up by the wall-mounted design letting the cabinet float above the floor. You'll simply adore how the chunky chrome hardware plays off the Gray Oak finish of the cabinet.Component Dimensions:Vanity dimensions: 31.3W x 17.7D x 21.8H in.Medicine cabinet dimensions: 27.6W x 30.3H in.Fitted rectangular sink dimensions: 23.6W x 17.7D in.About NameeksFounded with the simple belief that the bath is the defining room of a household, Nameeks strives to design a bath that shines with unique and creative qualities. Distributing only the finest European bathroom fixtures, Nameeks is a leading designer, developer, and marketer of innovative home products. In cooperation with top European manufacturers, their choice of designs has become extremely diversified. Their experience in the plumbing industry spans 30 years, and is now distributing their products throughout the world today. Dedicated to providing new trends and innovative bathroom products they offer their customers with long-term value in every product they purchase. In search of excellence, Nameeks will always be interested in two things: the quality of each product and the service provided to each customer. ACF by Nameeks ACF LON01-GW London 32-in. Single Bathroom Vanity Set. Modern wall-mounted vanity set. Engineered wood cabinet with metal feet and pulls. Glossy White finish with polished chromed accents. 2 soft-close cabinet doors. 3 pullout drawers for added storage. Choice of Faucet drill holes. Rectangular white ceramic sink bowl. Includes vanity, sink, mirror, 4 legs, and vanity light. Faucet not included. The ACF by Nameeks ACF LON01-GW London 32-in. 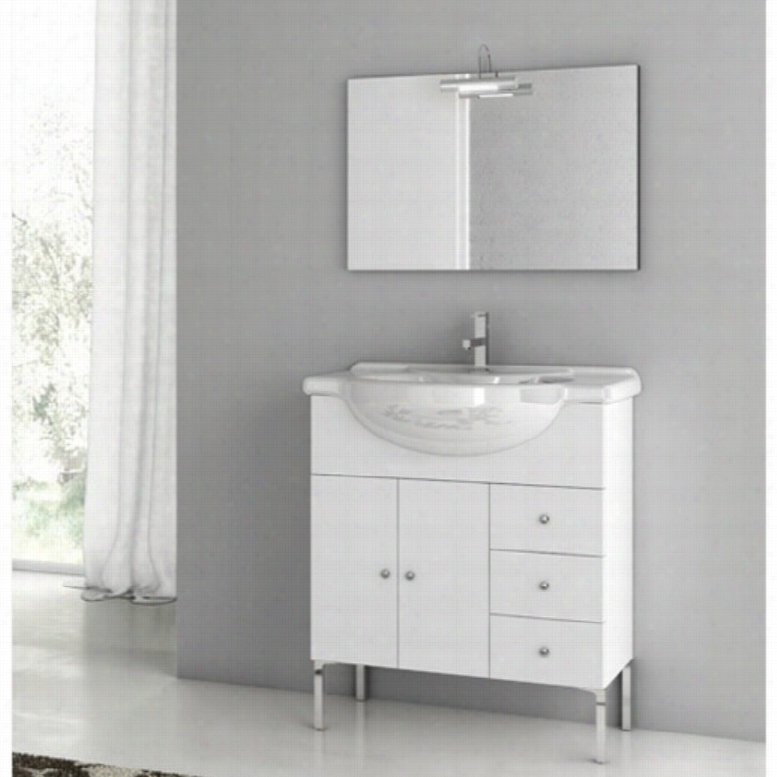 Single Bathroom Vanity Set - Glossy White brings a sleek, modern, and practical look to your bathroom remodel. This five-piece set includes a two-door, three-drawer vanity cabinet, fitted ceramic sink, vanity mirror, vanity light, and four polished chrome feet. It comes in Glossy White with chromed accents for a clean, polished look. The vanity is wall-mounted for stability, which means the legs may be added or not - your choice! Chunky pulls open the two soft-close cabinet doors and three drawers to reveal ample space within each. The mirror and its light make this set complete.Component Dimensions:Vanity dimensions: 31.5W x 14.6D x 26.4H in.Mirror dimensions: 21.8W x 33.5H in.Fitted rectangular sink dimensions: 33.9W x 14.6D in.About NameeksFounded with the simple belief that the bath is the defining room of a household, Nameeks strives to design a bath that shines with unique and creative qualities. Distributing only the finest European bathroom fixtures, Nameeks is a leading designer, developer, and marketer of innovative home products. In cooperation with top European manufacturers, their choice of designs has become extremely diversified. Their experience in the plumbing industry spans 30 years, and is now distributing their products throughout the world today. Dedicated to providing new trends and innovative bathroom products they offer their customers with long-term value in every product they purchase. In search of excellence, Nameeks will always be interested in two things: the quality of each product and the service provided to each customer. 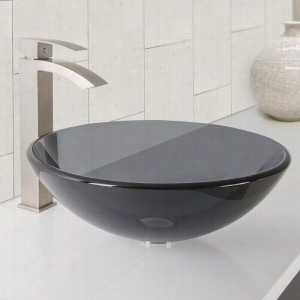 Vigo Industries VGT1035 - Sheer Black Glass Vessel Bathroom Sink and Duris Bathroom Vessel Faucet. 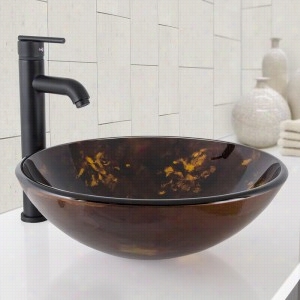 Vigo Industries VGT1029 - Brown and Gold Fusion Glass Vessel Bathroom Sink and Seville Bathroom Vessel Faucet.